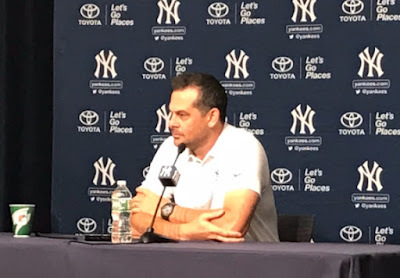 Brooklyn Digest: Boone: Yankees Have To "Go deliver on what we believe is a really good club"
Boone: Yankees Have To "Go deliver on what we believe is a really good club"
Aaron Boone. Photo by Jason Schott. 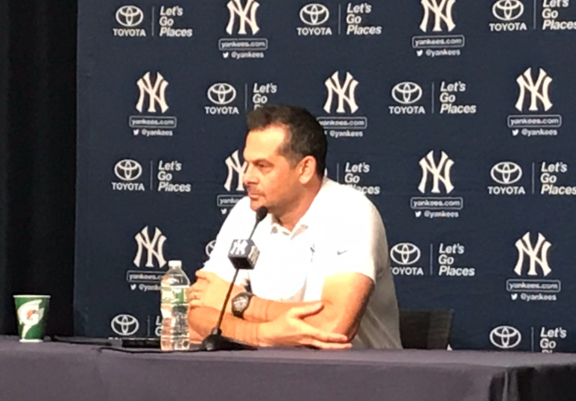 Yankees Manager Aaron Boone addressed the media on Wednesday afternoon as spring training in Tampa commenced with the arrival of pitchers and catchers. Boone enters his second season at the helm after winning 100 games last season as a rookie manager. The Yankees beat Oakland in the Wild Card Playoff game before falling to Boston in the Division Series. On how it feels entering this season compared to last year, Boone said, "I don't know how much different because it's, I've said a couple times, it's just this living organism that every day is a continuation from where you began, so I guess in some way, looking back, you know, certainly feel way further ahead of the game just in knowledge of our organization, the relationships I have within our organization, not just with our players, but all of the people in the front office, all the people behind the scenes that I know, know who they are, know about their families, what their role is, know where to go for something that I might be looking for. There's no question that just being much further along at this point, but in a lot of ways, I feel like I walked in fairly comfortably last year at this time." Boone said of what he learned in the past year, "Living in the northeast as I do, spent a lot of time at The Stadium, so a lot of conversations that spanned the entire offseason, the entire winter, with small things that we're trying to implement or want to implement that we'll implement a little bit here in spring training. "I think in a lot of ways spring training will look very similar to last year, but there's definitely some things that, hopefully, we continue to evolve as a club, hopefully allow us to improve all the time on the margins, and help us reach our peak." The Yankees entered last season with massive expectations, and the same goes for this season. Boone said of how he addressed them then and will now, "There's no question we'll embrace those. I haven't addressed the team yet, so not sure exactly how I'll put it. I like to get up in front of them anytime, whether it's to start spring training or anytime during the season where I address the club, and kind of let it rip and say what I'm thinking. There'll certainly be some things that I hit on with our club the first day, but for the most part, I like to get up and kind of speak from the heart about our expectations, and there's no question we'll embrace those expectations. I think everyone that's been here awhile, and certainly the new guys coming in, I think understand what goes along with having the kind of club we potentially have, and being within this organization, that the expectations are great, so we welcome that, we look forward to that, and hopefully this year, we can get to the top of the mountain." The Yankees acquired starting pitcher left-hander James Paxton from the Seattle Mariners, signed infielders D.J. LeMahieu and Troy Tulowitzki, and added Brooklyn native Adam Ottavino to their bullpen. On if this roster is better than their 100-win team last season, Boone said, "I hope so. We feel like, I feel like, (General Manager) Brian (Cashman) and his staff have done a great job of adding reinforcements to our team, I think creating even greater depth for us going into this year, you know, probably a few more moving parts, a few guys that we expect to have more versatile roles that really play into our depth. Obviously, adding some of the pitchers that we've added, both starters and relievers, I feel like as we sit here in early February, on paper, we probably look a little bit stronger, but now we've got to go out and make sure we keep guys healthy, keep guys posting, and go deliver on what we believer is a really good club."